Monday Night’s Raw saw the first in ring acknowledgement of Emma, a newly called up female wrestler from NXT. From her first glimpse on the show, you might have already dismissed her. If you have, I would implore you not to. Emma is the first female talent that I think has the potential to not only be a money maker, but the new female face of the company. She’s that good. But you’d never know it by what you saw on Raw last night. In the summer of last year, I grew tired of Raw and SmackDown and wanted to shake up my weekly wrestling experience. After hearing endless praise about NXT, I decided to give the show a shot. NXT introduced me to Emma, and at first I didn’t like her. But, time is a funny thing. As I kept watching NXT, Emma kept getting better and doing amazing things. She wrestled, did backstage promos, got an Austin style stare down with her main rival Paige, and wrestled Paige in one of the top 3 WWE women’s matches that you never saw. Emma has a lengthy history on TV and has consistently held her own as a believable, bankable talent. She should absolutely be where she is now, without question. But as much as Emma grew on me, deep down inside, I couldn’t shake a feeling of fear. As a long time wrestling fan, I know what WWE women are. They are (collectively): Hoeskis, mean girls, girls who are jealous, stupid, fat, crazy, and Natalya. Unlike on Raw, NXT’s women are diverse in personality and provide a large chunk of entertainment, on each week’s show. 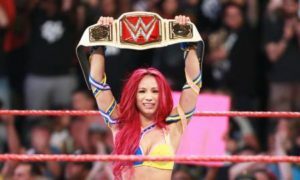 The differences between Raw and NXT women put a bright spotlight on WWE’s backward mentality toward female characters. Meaning that if used the right way they can be a great asset. But, that’s another rant for another day. I knew that Emma would have some hurdles to climb once she made the main roster, but I chose to believe that Emma could overcome naysayers with a strong debut. From the moment we saw shots of Emma in the audience holding signs, I feared trouble. But I still held on to hope. Maybe we could get a backstage segment with Renee allowing her being adorable and that would be enough, right? That, sadly, is not what happened. WWE did the opposite of that. I’m assuming we all saw the show last night, so I’ll skip a detailed explanation of what happened. All I can say is once I saw the words ‘stupid’ and ‘not another dance off!’ pop up on my Twitter timeline, I just about died. WWE, I have something to say to you. Emma should not be used only as filler. She’s capable of much greater things than awkwardly dancing after a Great Khali match. If you, WWE, let Emma be Emma, she will be granting wishes and pushing merchandise in no time. Monday night was not the best start, WWE. She’s not irrevocably broken, but pairing her with Santino is starting down that road. Last night’s introduction to Emma was underwhelming, but it’s not to late to make rectify this error. Take it from me. Emma has a bright future in this company. She’s unique, beautiful and completely original. Letting her be herself will take her far. But, WWE, if you continue cutting out Emma’s legs from under her, she’ll be predictable, stereotypical, and tea partying with Santino in no time.